You might not think so when you’re looking at your paystub and seeing all the taxes your employer has withheld from your earnings, but we have it pretty easy today compared to taxpayers 50 to 100 years ago. The government has had its hand out for a share of our money in some form of taxation since before the ink dried on the Declaration of Independence, and at some points in our history, it’s taken quite a lot from a select few. In the beginning, there were no income taxes and there was no federal government—at least not in America. But the colonists still had the British government to deal with. Individual colonies made ends meet by taxing a variety of things other than income, such as the mere existence of all adult males. That’s right—men had to pay a “head” tax in some colonies. Excise taxes, real estate taxes, and occupational taxes were all alive and well before the Revolutionary War as well. Now, about that war. You’ll recall that it was prompted by “taxation without representation.” The English Parliament first passed the Stamp Act affecting colonists in 1765. Then, a short time later, it began taxing their tea—all this without giving them a voice in Parliament. The colonists didn’t take this well, organizing the Sons of Liberty to waylay three ships that were delivering tea to Boston Harbor in 1773. Britain retaliated and the rest, as they say, is history. 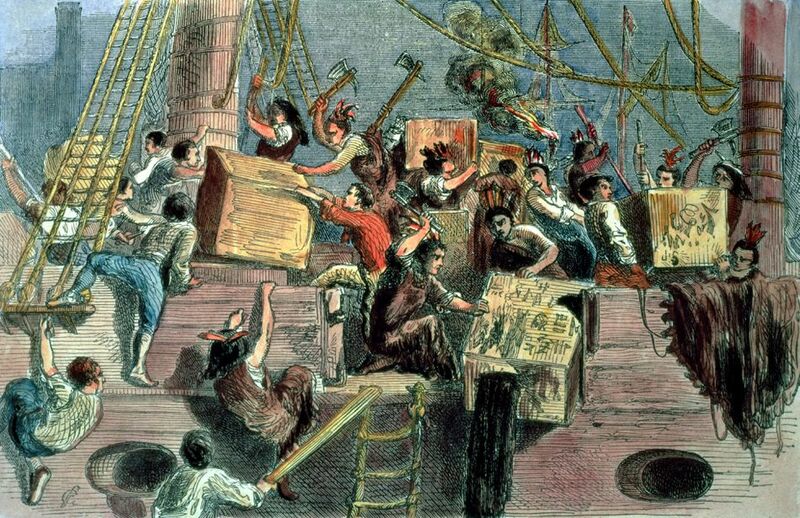 The Boston Tea Party escalated into the Revolutionary War. Individual states financed the federal government in the years following the birth of the nation, at least until our Founding Fathers decided that depending on their fiscal generosity put the country in a precarious position. The Constitution was drafted and ratified in 1788, providing that Congress was entitled to “lay and collect taxes, duties, imposts, and excises” so the country could effectively begin supporting itself. The states were put in charge of collecting those taxes and turning them over to Uncle Sam, but there was no federal tax on income—yet. Excise taxes were common, however, and it turned out that Americans felt as strongly about their whiskey as they had about their tea in decades past. Alexander Hamilton made the grievous error of trying to impose an excise tax on alcohol in 1791. The Whiskey Rebellion followed, forcing President Washington to send federal troops to southwestern Pennsylvania to impose order on a mob of angry and unruly farmers who really wanted the federal government to leave their liquor alone. The federal government proceeded to impose “direct” taxes on Americans after this—that is, individuals were taxed based on the value of things they owned, including slaves and land, but not their incomes. But President Thomas Jefferson pulled the plug on direct taxes in 1802 and the country went back to just collecting excise taxes. Congress inflated these taxes and introduced new ones to pay for the War of 1812, but even these provisions were repealed five years later in 1817. The concept of federal taxation eventually fizzled, and the country made ends meet through the sale of public lands and customs duties for the next 44 years until the advent of the Civil War. Wars cost a lot of money, so Congress was forced to go back to the taxation drawing board to raise revenue when the Civil War broke out in 1861. The income tax was officially born, imposed at a rate of 3 percent on all citizens who earned more than $800 a year. But as it turned out, this wasn’t enough to fund the war. Congress had to breathe new life into excise taxes a year later in 1862. Little was spared from these taxes. They were imposed on everything from feathers to gunpowder and—once again—whiskey. The year-old income tax was tweaked for the first time now as well. Instead of just one 3-percent tax rate, a 5-percent rate was introduced for all citizens who were lucky enough to earn more than $10,000 a year. The lower threshold was tweaked as well – anyone with an income of more than $600, not $800, was now subject to the tax. This was also the first time that employers were charged with responsibility for withholding taxes from workers’ pay. What we now know as the Internal Revenue Service came into existence as well. Back then, it was called the Office of the Commissioner of Internal Revenue. Just like today, it was charged with collecting everyone's taxes. Individual states were relieved of that duty. Ten years later, the income tax was repealed. The federal government pretty much went back to supporting itself by taxing mostly tobacco and liquor after the war ended. This policy lasted for another 45 years except for a brief hiccup in 1894. Congress again attempted to implement a flat-rate income tax in that year, but the Supreme Court promptly declared that it was unconstitutional. It didn’t take states’ populations into consideration, a practice that was provided for in the Constitution. Life in the 19th century doesn’t sound too bad now, does it? Life without income taxes became a fond memory with the passage of the 16th Amendment in 1913. The amendment got rid of that bothersome provision in the Constitution that taxes had to be levied based on states’ populations, and the income tax was reborn. This time, however, the lowest rate was only 1 percent for those with incomes of up to $20,000. It increased to 7 percent for those with incomes of more than $500,000, which comes out to about 11 million in 2017 dollars. With the way the new tax law was set up, barely 1 percent of Americans actually paid any income taxes. Form 1040 came into existence for the first time with the passage of this amendment, so now all taxpayers could dutifully roll up their shirtsleeves once a year to figure out what they owed and report it to the IRS. All earners were taxed the same – the amendment did not provide for filing statuses such as single, married or head of household. With war looming again, tax rates skyrocketed shortly after the 16th Amendment was passed. The 1916 Revenue Act was enacted midway through World War I when the U.S. once again found itself in desperate need of tax dollars. The 1-percent rate was increased to 2 percent, and the top rate went up to 15 percent for taxpayers who enjoyed incomes of more than $1.5 million. Then, a year later, the War Revenue Act of 1917 increased tax rates yet again. This Act also cut back on exemptions available to taxpayers. Those with incomes in excess of $1.5 million suddenly found themselves paying taxes at the staggering rate of 67 percent. Even a guy earning only $40,000 was hit with a 16-percent tax rate. And so it went. Rates were increased yet again with the Revenue Act of 1918, increasing the top rate to 77 percent. The 1930s were an economic seesaw. The economy burgeoned and bloomed after the war. The federal government found itself standing on steadier financial feet so Congress obligingly slashed those exorbitant tax rates. They went back to a range of 1 percent to 25 percent. Then came the Great Depression. The stock market crashed in 1929, and the government found itself scrambling for money yet again. When tax rates were increased this time, the hike heralded a period during which the top rates were exorbitant. They rose to 63 percent in 1932, then increased to a mind-boggling 79 percent in 1936. At least the lowest tax bracket increased to only 4 percent. Needless to say, the tax hike didn’t help the floundering American economy to bounce back. After paying these significant taxes, Americans didn’t have much left over to spend, so the rate increase was, at best, counterproductive. The Depression also prompted the 1935 Social Security Act to provide for those who were aged, handicapped or otherwise “needy." This initial version of Social Security pretty much served as unemployment insurance for those who had lost their jobs. The first Social Security tax was set at 2 percent­—1 percent paid by workers and 1 percent paid by their employers—on wages up to $3,000 annually. The first Social Security taxes were collected in 1937, but benefits weren’t paid out for another three years, by which time the Depression had ended. Tax rates continued to escalate in the 1940s as the U.S. engaged in World War II and, of course, needed money to fund that war effort. Three new tax laws were passed in 1940 and 1941, both raising rates and eliminating exemptions. As a result, those with incomes of $200,000 or more pretty much had to give everything they earned to the IRS—the highest tax rate went up to a staggering 94 percent. Even those who earned only $500 or less had to give almost a quarter of their meager wages to the government­—23 percent. The number of taxpaying Americans increased by 39 million between 1939 and 1945, although the Individual Income Tax Act threw taxpayers a bit of a bone in 1944. It introduced standard deductions on Form 1040 to reduce taxable income a little for the first time. The IRS really came into its own in the 1950s. Its name was officially changed to the Internal Revenue Service in 1953, and by the end of the decade, it was reportedly the largest, most powerful accounting and collection agency in the world. The IRS got its first toll-free telephone line in 1965, and computers were introduced in the late 1960s, affording IRS agents a new and easier way to scrutinize returns. By 1992, most taxpayers could file their returns electronically. The Taxpayer Advocate Service was rolled out in 1998 to assist taxpayers who fell afoul of the IRS. Medicare officially joined the Social Security tax as part of the Federal Insurance Contributions Act in 1965. By 1980, these combined taxes increased from the initial 2 percent Social Security tax to a 12.3 percent rate. Tax rates remained uncomfortably high through the 1950s, still set at 87 percent for the country’s wealthiest taxpayers through 1954 before finally dropping to 70 percent in the 1970s. Relief finally came in 1981 with the passage of the Economic Recovery Tax Act. Tax rates fell by about 25 percent, then Ronald Reagan moved into the White House and spared taxpayers even more. The highest tax rate had been sitting at 50 percent when he took office thanks to the ERTA. Then Reagan signed the Tax Reform Act of 1986, slashing it to 28 percent beginning with the 1988 tax year. The TRA compensated by taxing businesses more heavily than individuals. Personal exemptions were increased and indexed for inflation so they would continue to keep pace with the economy, as were standard deductions. Unfortunately, tax rates began inching up again in the 1990s after Reagan left office. The highest rate eventually reached 39.6 percent, where it remains today except for a drop to 33 percent from 2003 through 2010 thanks to President George W. Bush and the Economic Growth and Tax Relief and Reconciliation Act of 2001. That Act dropped the lowest tax rate to 10 percent and it also increased the amount of the Child Tax Credit and the Child and Dependent Care Tax Credit. It was heralded as one of the greatest tax cuts in American history. Instead of holding your head in your hands the next time tax season approaches, just tell yourself that it could be worse. You don’t have to part with almost all your income like those wealthy taxpayers back in the 1940s.